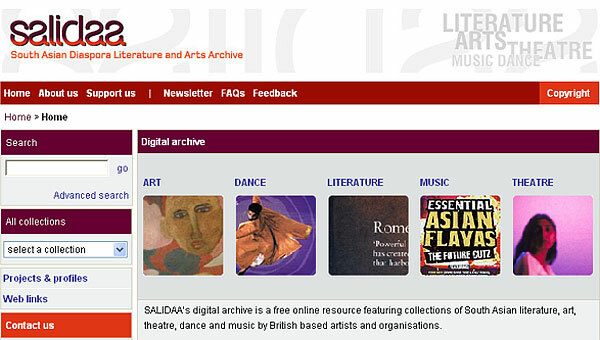 The SALIDAA digital archive aims to showcase the richness and diversity of contemporary South Asian literature and arts in England by digitising a variety of text-based and visual material accompanied by descriptive and contextual information. Although not comprehensive, the digital archive provides a representative sample of the artistic and cultural contribution made by South Asian people to the developments of arts and literature in England. New aesthetic forms have grown out of the interaction between more traditionally perceived "Western" art forms and those of the Subcontinent, both classical and contemporary. This is visible across all disciplines, from literature to theatre, dance, visual arts and music. The collections featured in the archive testify to this fertile interaction and the injection of new blood that South Asian artists have provided to English cultural, literary and artistic heritage. The digital archive covers five main areas: literature, visual arts, theatre, dance and music and includes material in the English language dating, approximately, from 1947 to the present. A wide range of materials are being digitised, such as excerpts from fiction, poetry and plays, manuscripts and writers' notes, images of art works, photographs, leaflets, brochures and programmes of events, stage and costume drawings of theatre and dance performances, lyrics, CD and record covers, and music scores. As a future development, one of the main priorities for SALIDAA is to add material in South Asian languages as well as audio-visuals, and to extend the coverage to include films. We will also aim to cover the rest of Britain and collect material which pre-dates 1947. The SALIDAA digital archive is the first step towards the setting up of a permanent physical archive. As part of the digital archive project, SALIDAA is working closely with donors of archive material, both individuals and organisations, to select items for digitisation and collect material to house and preserve in the physical archive in the long term. If you are a British-based writer, artist, theatre or dance performer or musician of South Asian origin and would like to be featured in the SALIDAA digital archive or deposit material in the physical archive, please contact us . We will be delighted to work with you.